WASHINGTON (Sept. 11, 2014) -- In the Pentagon courtyard, on the evening of the 13th anniversary of the Sept. 11, 2001 attacks, service members from around the Washington, D.C. area participated in a first-of-its-kind commemoration where each repetition in their " workout of the day" was symbolic in some way of that day's tragedy. Billed as a "9/11 Tribute WOD," the event was meant to provide a new way to look at the tragedy of 9/11, said Army Staff Sgt. River Mitchell, who conceived the unique commemoration. Army Staff Sgt. River Mitchell participated in an intense physical training workout at the Pentagon, Sept. 11, 2014, held to commemorate the 13th anniversary of 9/11. Mitchell, vice president of the Military District of Washington Sergeant Audie Murphy Club, also planned the event. "Every year since I have been at the Pentagon, we do the same memorials," Mitchell said. "I think that things that are different, and things that are fun, can raise awareness in a more positive way. I think this is an event that can bring new sight on the memory of the attacks and what happened." Mitchell is a chef in the Secretary of Defense Mess at the Pentagon. He is also vice president of the Military District of Washington Sergeant Audie Murphy Club, which recognizes non-commissioned officers who have contributed significantly to the development of a professional non-commissioned corps and a combat-ready Army. The club sponsored the commemoration. 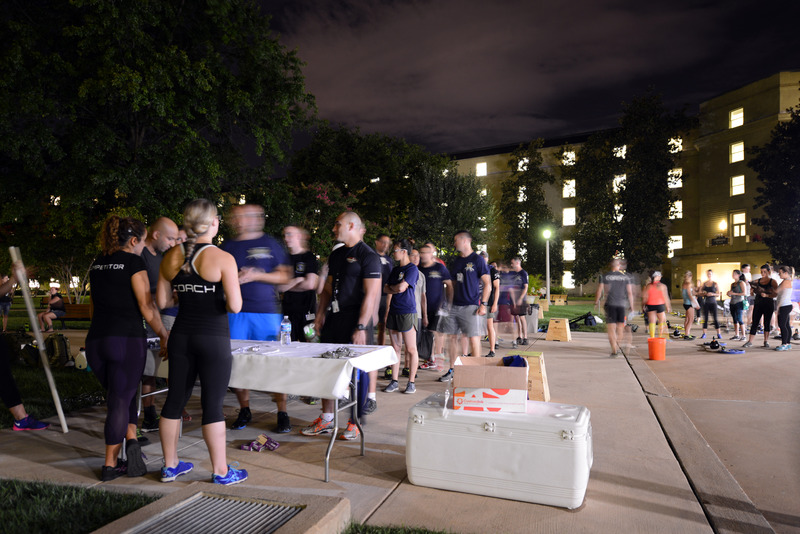 In the Pentagon courtyard, 50 participants were paired off into 25 teams, to embark on a unique CrossFit workout. "Every rep, every weight, is in memory of 9/11," Mitchell said. The evening's workout consisted of, among other things, 175 thrusters, representing United Airlines flight 175, which crashed into the South Tower of the World Trade Center; 110 deadlifts and 110 lunges to symbolize the 110 floors in each of the World Trade Center towers; 2,001 meters of rowing to symbolize the year; 93 box jumps to symbolize United Airlines flight 93, which crashed in Shanksville, Pennsylvania; 77 kettle bell swings to symbolize American Airlines flight 77, which crashed into the Pentagon; and 125 burpees to symbolize the 125 personnel killed at the Pentagon. To successfully complete the workout, Mitchell said, service members will need to apply the same tactic they have used to find success in military endeavors. "The team is what will make you or break you here. If you have a good working relationship with your partner, and you guys go through the workout well, you will be a beast at this workout," he said. Marine Corps Staff Sgt. Daniel Martinez, who works for the Office of the Secretary of Defense, participated in the commemorative workout. He said during 9/11, Americans should think not just about the service members still in combat, but their families too. "I think Americans should remember about service members, what they sacrifice ... especially those who joined after 9/11," Martinez said. "They have to understand we have been in a constant war with terrorists, and they never go away. Anytime anybody joins, especially now, they must understand they are making a huge sacrifice -- and their family is too." While the planned workout was difficult, Martinez said he thought he would get through it fairly easily. "This competition has a lot of reps involved. A lot of different exercises," he said. "Fortunately it's a partnered WOD. Otherwise I don't see myself doing over 100 burpees by myself. But it should be pretty good. I have the fundamentals in CrossFit -- kettlebell swings, burpees, thrusters, rowing. It's going to be a great workout." Sgt. Kevin Arwood, a culinary specialist, works alongside Mitchell in the Secretary of Defense mess. He's originally from Peru, Indiana. When 9/11 happened, he was 23 years old. "I went into work later in the day, and I remember thinking things have changed, and it was very uncertain," he said. Arwood didn't enlist in the Army immediately after 9/11, but joining was something he said he had thought about for a long time. "I have a lot of family that was in the military, and it was something I always wanted to do," he said. Arwood also cited military families as being something Americans should think about on 9/11. "Not only are the service members sacrificing their time -- sometimes blood and lives -- but sometimes we forget about the family members that stand behind those service members," he said. "Without them we are not able to do our jobs on a daily basis. Wives and husbands and kids and parents -- all those people -- make it possible for us to do our job." Navy Chief Petty Officer Jason Gooch, who serves as the leading chief petty officer of Mess 1 at the Pentagon, is originally from Burlington, Iowa. He said he works hard to stay fit, and also prepared himself for the fitness challenge. Participants sign in before beginning an intense physical training workout at the Pentagon, Sept. 11, 2014. The workout was held to commemorate the 13th anniversary of 9/11. "Every day I go to the gym here at the Pentagon. I go five days a week. I started preparing for this event three weeks ago," he said. "Every day we'd take half the events. We'd do overhead lunges, we'd do kettle bell swings, we'd do burpees, we'd do pull-ups -- anything that can get me ready for today, a lot of deadlifts and a lot of pain." For Gooch, 9/11 wasn't the reason he joined the Navy, but it instead validated for him his decision to join. At the time, he said, he had been recovering from an operation to correct a hernia -- a condition that he discovered for the first time on his way through the Military Entrance Processing Station. He was scheduled to go into the Navy after his recovery period ended. "9/11 happened a few months before I went to boot camp," he said. "When it happened, I knew that this is what I wanted to do." Gooch said Americans need to know that service members do what they do for them. It's why he gets up in the morning, he said. "We are one percent of America, and we do it for America," he said. "I get up every morning and know I am doing something that a lot of people before me wish they could have, if God had given them an able body. I love this. I'm going to do 20 years because I love it. It's not the pay. It's not the fame or the awards. It's getting up every day and knowing that I'm serving my country." A lot of service members will say they loath working in the Pentagon. But Gooch said the experience is humbling, and something he is proud of. "I was telling the guys, two years ago I never would have thought I would be here," he said. "I put in my application and got selected. And now here I am working in direct support of the secretary of defense. Every day I come to work, I am still in awe. I see the building lit up, and I am walking towards the Pentagon, and I say here I am -- the Pentagon. Walking in the hallways I am reminded that so many people, famous people, people who have done great things for this country, have walked down the same halls." Air Force Staff Sgt. Maria-Antonette Capio Cabantog serves also as a culinary arts specialist. She lived in the Philippines when 9/11 happened -- she was just 11 years old then. She said being in the Pentagon has challenged her to improve her fitness. "I have been physically active since I've been here, getting involved in the CrossFit workout, and trying to stay busy and productive," she said. "Being here at the Pentagon, I see a lot of fit people. I try to keep up with them." For nearly an hour, the 50 participants cycled through the various workout routines, until the event was called to a close. Mitchell, who designed the commemorative workout and who also works out six times a week, said he might have underestimated how difficult it would be. "The workout was tough. Me and my buddy, we made it up," he said. "We thought we would blow through it in 35 minutes -- it took me 43. But I think this is going to happen every year now. It's something the club can sponsor, and it's going to get better every year." Mitchell said during 9/11, he wants Americans to remember that the nation is still at war. "Soldiers are still fighting, Airmen are still fighting, Sailors are still fighting, and Marines are still fighting," he said. "Just because what we may see on the news, what we may be hearing about pulling out, I think the most important thing is: never forget that there are still troops in battle fighting for our freedom. I think it's my duty to get back over there. It's everyone's duty to serve their time there, and protect our nation. That's really what we signed up for, to defend and protect our nation." As vice president of the Military District of Washington Sergeant Audie Murphy Club, Mitchell said sponsorship of the 9/11 Tribute WOD is another way to spread the word about the club. He said he hopes he can help expand it, and further its reach. "I think this is a club that can really help not only Army, Navy, Marine Corps, Coast Guard and Air Force folks, but also reach out into D.C. high schools and middle schools -- to kids that need that mentorship. They can get that through our club." With the tribute workout, he said, he's also interested in influencing the way the Army does physical training. "I want this type of working out -- be it CrossFit, or high-intensity training -- I want the Army to base their new PT plans off of this. I think this is going to be the battlefield of the future," he said. "Let's take some time to learn from the movements, the technique, how intense this is for a short amount of time, and compare it with what each branch is doing now."